This year’s Rocky Mountain Whitewater Championships were a success measured by eleven new racers, and two racers who came back to racing after several years away from the gates. We had athletes from five countries participating, including one Olympian and eleven current or former US national team members out of a total of 42 athletes who raced. With the help of Brian and Sherri Fike, we also were able to qualify 12 new nationals certified officials, from three different clubs. The only thing that would have made this an even more fabulous weekend of racing would be even more athletes from the clubs all around Colorado. 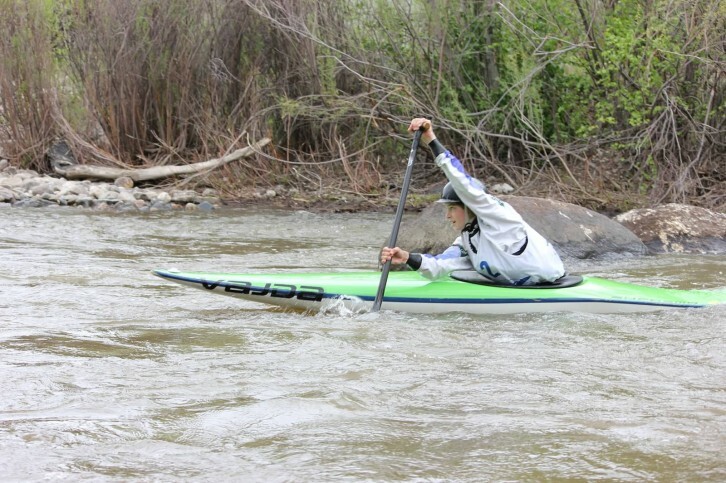 The format was that we had two days of slalom racing and a wildwater race. On Saturday we had qualification runs after which we recognized athletes at the beginner/intermediate level. On Sunday we had finals for the intermediate and advanced athletes. Both courses were set by Jordi Domenjó Cadefau who came in courtesy of Laura Bohn to lead our local practices for two weeks. Jordi is our inspiration and our mentor. Sunday afternoon we had our annual wildwater race which was well attended. There are five local athletes who will be competing at NOC in the Jr U23 Wildwater World Championships. One of the great things about this race is the community spirit of volunteerism. Russ Huff did an amazing job of organizing the timing and scoring; he was also the driving force behind hanging the gates. Laura Bohn did a fabulous job organizing volunteers. Most of the judges were parents of athletes from the Dawson school. This was a great way for some parents to learn the sport and understand what it takes to hold a slalom race. Other parents had the satisfaction of sharing their expertise as nationally certified slalom officials. We are grateful to Brian and Sherri Fike for serving as chief judge and chief of scoring.